Water content (often referred to as moisture) plays a crucial role in preserving material. Back in the day, people relied on their “nose” or general experience while determining moisture in certain materials. Your everyday construction contractors, floor contractors, restaurateurs, carpenters, and DIY warriors no longer use their nose while measuring moisture; they use moisture meters! 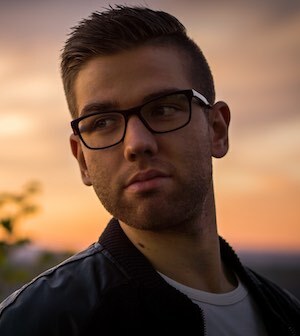 In this article, we are going to discuss the benefits of these devices, as well as the factors you must consider before you buy the best moisture meter for yourself. We will also suggest you our top 6 picks while explaining their characteristics and features in an objective and unbiased manner. Interested? 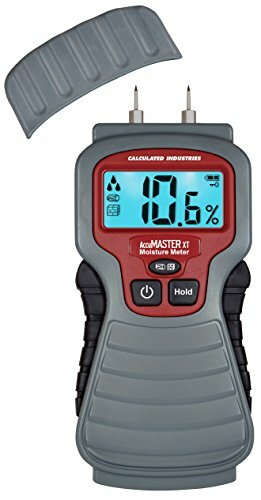 What is the best moisture meter to buy in 2019? The General Tools MMD4E is a pin type meter with accurate reading and user-friendly LCD screen. This product is reasonably inexpensive and made for everyday homeowners. Its primary purpose is to help average users to read moisture in their home to prevent floods and water damage. This device is a pin type reader, meaning that it uses built-in pins to calculate moisture level in materials. We will discuss types of moisture meter in our buyer’s guide (see the section On Types Of Moisture Meters for more info.) The MMD4E is intended for reading moisture in wood and drywall. You will have to insert the pins in the material and wait a few seconds for it to calculate moisture. Naturally, you can’t use it on other building materials (like concrete or bricks) because the pins won’t penetrate the surface. Aside from finding and preventing leaks, this device is also recommended for restaurateurs and woodworkers. Device itself is well built and ergonomic. The easy-to-read LCD screen displays material type, as well as the moisture level (in percentage.) This device is exceptionally accurate, which is why we recommend it to anyone that is looking for inexpensive and accurate moisture meter. It is a pin-type reader, meaning that you’ll have to stick the pins for an accurate reading. This procedure will create holes in your material, so make sure that you are okay with using it. Having two tiny holes in your floor shouldn’t cause you any issues, but it might cause problems for restaurateurs. 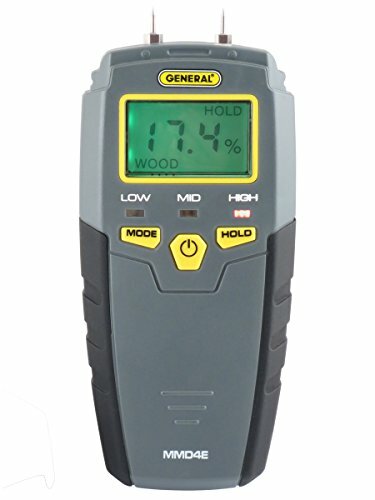 The General Tools Moisture Meter is easy to use and comes with a protective pin cup. It reads from 5-50% moisture level in wood, so feel free to use it to determine moisture level in firewood too! The AccuMASTER XT 7440 is made by calculated industries and is used predominantly by general contractors and DIY warriors. It is the least expensive item on our list, but still accurate enough to be used by the most demanding customers. This item also comes with a cup that protects the pins when not in use. The meter is well built and ergonomic, and the pins feel sturdy and durable (made of stainless steel.) It also comes with an integrated screen that is much more advanced than any other on our list. The screen displays results in large digits, ensuring that everyone can read the results from virtually any distance. In the top right corner you can see the battery level, and below it, you’ll see the lock/freeze indicator. This indicator will pop up when you press the Hold button, and you push the Hold button when you want a more convenient reading. The AccuMASTER XT is also recommended for woodworkers since it measures wood moisture only. It is best to use this meter for checking hardwood, plywood as well as lumber. This device also has some cool features that will prolong its use. For instance, it will turn off automatically if not used in 3 minutes to preserve battery level. Wagner is the name that rings a lot of bells in the tools industry. Their MMC220 is durable, accurate and multifunctional, perfect for anyone that is willing to pay a lot of money for a high-end machine. 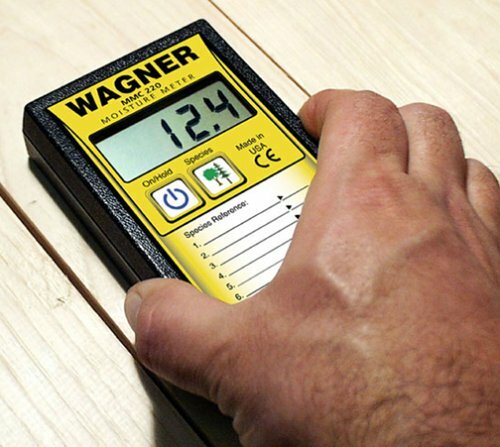 The MMC220 is Wagner’s most popular moisture meter, intended for professional restaurateurs, carpenters, realtors, and other users. This meter is pinless, meaning that it won’t damage the measured material in any way possible. You can simply lay this meter on the dedicated material and let it do its magic. This meter is also highly sophisticated. It is built for measuring moisture in standard and exotic wood. This item also comes with a CD that features reference library for various types of wood. You can then write down the numbers on your meter so that you don’t have to refer to a CD all the time. The MMC220 comes with a shock resistant carrying case, which is perfect for professionals that travel a lot. It also features straightforward controls, allowing you to turn off/on the meter, as well as to pause it and write down the results (or show them to your colleagues.) This device is highly sophisticated and is almost unaffected by outside temperature and humidity; feel free to use it in any conditions! The biggest issue with this device is its price; it is well above all other items on our list. However, the MMC220 is also the most accurate and sophisticated units on our list, built for professionals. If you are a restaurateur, go for this unit, not only because of its pinless design but its simplicity and sophistication. The Dr.Meter moisture meter is cost-effective, accurate and straightforward. With its 1.5% reading error, it is one of the most precise units on our list. It is also pinless, meaning that it won’t damage the object you are testing. This unit is simple to use and calibrate. Once set, it will give you reliable and consistent results with each time you use it, with little to no room for error. The screen will display moisture level, density preference, battery life, and other less critical data. The LCD screen isn’t colored, which might cause issues while reading in extremely bright or dark conditions. The device will also shut off after 5 minutes of non-use, which is excellent for those that forgot to turn it off but can be frustrating for professionals that use it frequently on a day to day basis. This item comes with a protective, well-padded case that will prolong the durability of this meter. But, the meter itself isn’t that sturdy, and could definitely use more support on the sides and more sophisticated engineering. If you decide to buy this meter, make sure that you manage it with care and patience. The main reason why would anyone use this device is because of its accuracy. 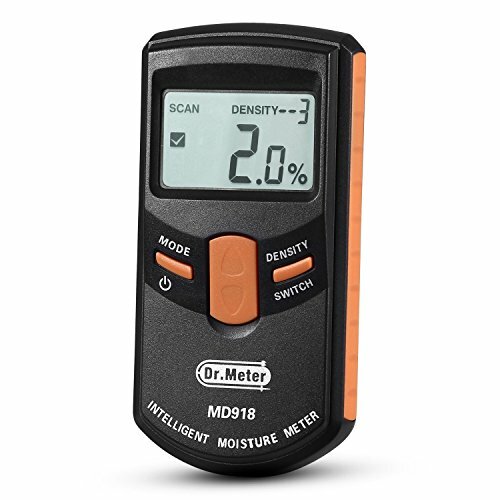 The Dr.Meter moisture meter is surprisingly accurate (considering the price), so feel free to use it if you are professional woodworker or restaurateurs. And one quick note; this battery compartment is very stubborn and won’t close at times. Should you experience issues with this, you can either ask for a replacement or simply tape it with standard adhesive tape. The Extech MO55 is the only 2-in1 device on our list, being both pin and pinless type moisture meter. Note that you can buy the Extech MO55 both as a pinless and pin type meter (separately), but we recommend that you go for the 2-in-1 version. You can use the Extech MO55 for measuring wood, plywood, concrete, brick and other building materials. Basically, if you are looking for a multi-purpose moisture meter then go for the Extech MO55. It also has a button dedicated to changing material type, allowing you to save time while you are on the job. For pin measuring, the Extech MO55 will calculate between 5 and 50%. When you switch to pinless measuring, it will go 0-99%. This device is also highly-sophisticated, outputting louder sounds as the moisture levels grow. The display will show easy-to-understand icons that will help you determine the moisture quickly and without any confusion. The only “issue” we have with this device is its accuracy. Don’t get us wrong; the Extech MO55 is an accurate machine. However, you can buy more precise tools (like the Dr.meter MD918) for less money. So, why would you then buy the MO55? Well, the MO55 is unique, since it can be used both as a pinless and pin type meter. Also, it is perfect for people that are looking for all-material type meters. Note that it comes with pin cover and that this device feels both ergonomic and quality made. If you seek multi-purposes and versatility in your moisture meters, then go for the MO55. 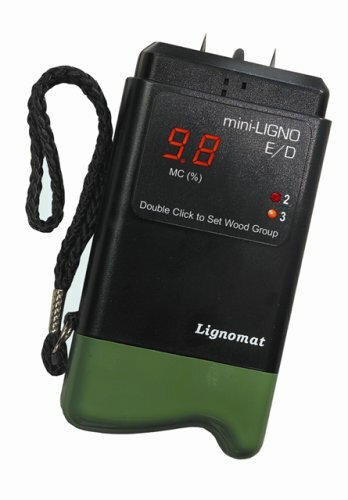 The Lignomat moisture meter (LMM) is accurate and robust, built for heavy-duty conditions. If you are a woodworker or a construction worker looking for sturdy moisture meter that can take damage, then continue reading this review. The LMM is a pin-type moisture meter, and it displays its results in red color on a black screen. This design feature ensures error-free and rapid reading with no room for error. The meter is highly responsive, and will immediately start measuring as soon as you stick the pins in a material. The meter is made of quality and shock-absorbing plastic and is fit for harsh conditions. Outer temperature or moisture won’t interfere with the measuring process, allowing people that work outdoors to get a quality reading. Also, the red & black screen will let you read your results in dark or under direct sunlight. We recommend this meter to those that want to measure moisture in firewood, medium wood, and hardwood. This unit wasn’t built for calculating moisture in exotic wood or other building materials (such as bricks or concrete.) If you need a simple item to measure moisture (for previously mentioned material), the LMM will suffice your needs. In this section, we will talk more about moisture meters in general (instead of talking about particular items.) Our goal here is helping you figure out whether you need a moisture meter, and what factors you need to consider should you decide to obtain a moisture meter for yourself. As the name suggests, a moisture meter is a device with which you can measure moisture. Note that a moisture meter isn’t a humidity meter; while humidity meter measures the water content in the air, a moisture meter measures water content in the material. Anyone whose work involves moisture measuring uses a moisture meter. The most regular users of moisture meters are general contractors, woodworkers, realtors, builders, and so forth. But, many people use moisture meters for non-professional reasons. For instance, you can use a moisture meter to measure moisture in your walls and prevent leaks. You can also use it to measure moisture in your firewood and see if it needs additional drying or if it is ready to burn. Some moisture meters can also be used for measuring moisture in concrete, masonry, stone, etc. There are two types of moisture meters: pin and pinless. Pin type meters were the first kind of moisture meters available to the general public. They feature pins with which they measure MC (or moisture content) in a material. The general rule says that pin type moisture meters are more accurate, reliable and consistent when it comes to moisture measuring. All pin type meters require that you stick the pins in wood (hardwood, firewood, plywood, etc.) But, saying that pin type meters are more accurate than pinless meters is no longer true. Pinless moisture meters can be just as accurate or even more accurate than old-fashioned moisture meters. Pinless moisture meters use electromagnetic waves to measure moisture. You have to lay them on material and wait for the meter to calculate the water content. Keep in mind that you have to position the meter according to the instruction manual to get an optimal and precise reading. Pinless Or Pin Type: Which Is Better? Each type has its own benefits. 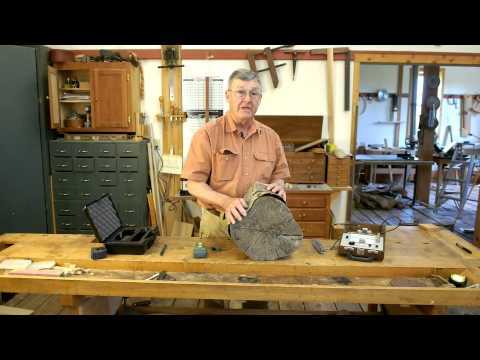 Pin type meters can read any kind of wood and regardless of its surface. Pinless meters, on the other hand, need to be well positioned and in contact with the material. You have to ensure that the sensor pad with its entire surface is touching the object; otherwise, you’ll get an inaccurate reading. Some pin moisture meters also arrive with long pins, with which you can get a core reading. These pins are also excellent for reading hardwood since regular pin meters often can’t get a 100% accurate reading of the dense material. A big problem for pin meters is that you have to probe and the material to get an accurate reading. This, of course, isn’t a problem if the material’s value won’t drop just because it has two tiny holes in it. However, renovated and refurbished objects can lose in value, and for them, you need a pinless moisture meter. Pinless moisture meters also allow you to read the non-wooden material, such as concrete or masonry. As you might already know, pins that are built-in pin type meters can’t penetrate concrete, stones or bricks. Also, just because pinless meters can measure moisture in other building material, that doesn’t mean that all meters read moisture in other building materials. Some of the moisture meters on our list can measure water content in concrete or bricks, but they are designed for measuring moisture in the wood. You should know that there are special moisture meters that measure water content in stone, concrete, masonry, etc. If you take a look at our comparison table, you’ll see a column concerning range. Here’s the thing: not all moisture meters are built for all purposes. 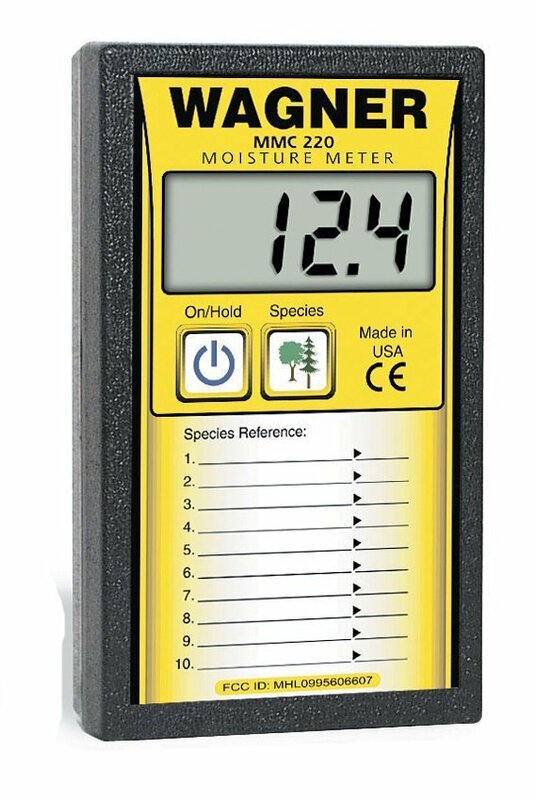 If you are working with raw lumber or firewood, you generally need a wide range moisture meter. However, if you are dealing with fine furniture or restoration, you need narrow range moisture measuring meter. If you are making a table or a chair, you’ll hardly be working with wood that contains 30% water content, right? The good news is that most moisture meters are built for various purposes, and can be used by all professionals. There are, naturally, fine differences that make one moisture meter more fit for a specific profession that the other. The most accurate device on our list is the Wagner MMC220 moisture meter, with it’s +/- 1% error chance. Interestingly, Wagner MMC220 is a pinless moisture meter; most people would expect higher accuracy from a pin type, not pinless moisture meter. Accuracy is also determined by the device’s consistency. When you measure the moisture of some material, you need to recheck your calculations. If the results differ by a lot, you can safely conclude that the device is inaccurate and unreliable. On the other hand, if the difference between each reading is marginal, you feel free to use the device. There are other things you could (but necessarily don’t have to) include in your selection process. For instance, consider whether you need a general-purpose or special moisture meter. What does that mean? Well, most moisture meters are pre-programmable, and their software measure moisture in a specific material. Some moisture meters (like Wanger’s) feature software that measures moisture in the exotic wood. Also, some moisture meters are better for hardwood floors, while others might be good for measuring moisture in firewood. Another thing you need to consider is the item’s durability. As we mentioned in our article, some items are sturdier than others and are built for heavy-duty conditions. Shops and construction sites aren’t a place for soft people and objects, and if you work in such places, you need to bring a proper tool with you. Furthermore, make sure that you buy an item with the adequate LCD screen. Seriously, it is almost impossible to read the numbers of a low-brightness display in dark or too bright conditions. And see that you are happy with the item’s design, ergonomics, and controls. Some items are more straightforward to use, while others emphasize more sophisticated controls and features. Whether you are a professional, DIY warrior or regular homeowner, you can benefit a lot from owning a moisture meter. And whether you use them to prevent leaks and mold in your home, or determine the moisture in firewood, moisture meters will pay for themselves after just a couple of uses. Use them adequately and according to instructions. Also, make sure that you buy the right item for your needs (refer to our buyer’s guide for advice.) Should you follow our guide, there’s no doubt that you’ll be happy with your purchase!